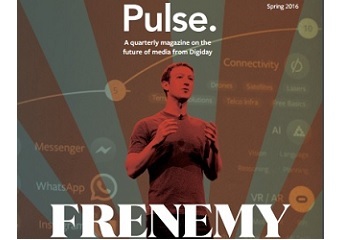 Part of the debut issue of quarterly media magazine Pulse. The short article by Ricardo Bilton in the debut issue of Digiday’s new quarterly media magazine Pulse is specifically about video views. Under the headline “WTF Is a View?” and the sub-headline “A view is a view view – except when it isn’t,” some basic primer information laid out in FAQ form. Facebook gave advertisers the option to only pay for video ads if users watched them for more than 10 seconds. Previously, advertisers were charged as soon as videos started playing. Twitter has also yielded to advertisers by only charging when videos were 100 percent in-view and watched for 30 seconds. There’s plenty more to page through in the Spring Issue of Pulse, including a profile of Choire Sicha. In the welcome letter, senior editor Lucia Moses offers this rather intriguing framing: ‘While Digiday is at its core a digital media company, we thought the printed format was ideal for exploring these critical issues in a thoughtful way.’ E.g., print still has a pulse, albeit one that beats at a once-every-three-months pace.